Mushroom Meatballs (Vegetarian) are truly the best vegetarian “meatballs” I have ever eaten. And they only take 45 minutes! Easy peasy. Hi. It’s Lois in the kitchen at Recipe Idea Shop. 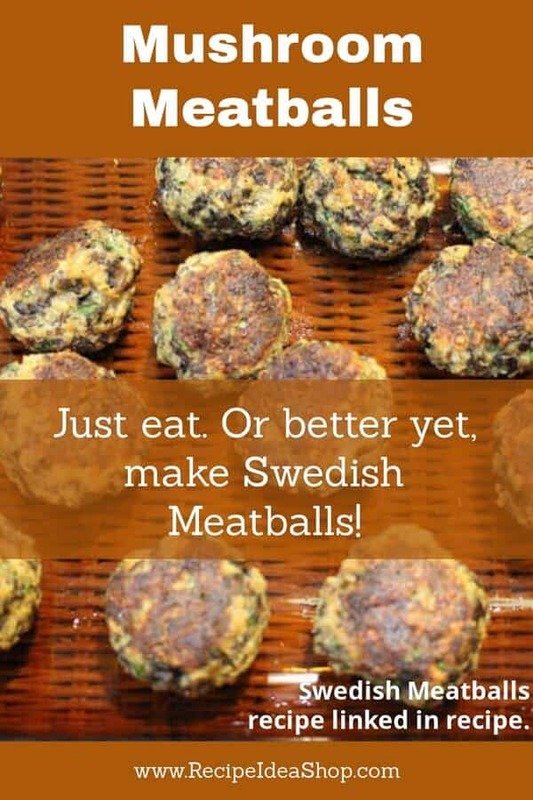 These vegetarian Mushroom Meatballs have a very meaty texture and are perfect for substituting in Swedish Meatballs, one of my daughter Erin’s favorite meals. Don and I both thought they were delicious. 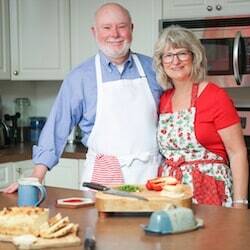 Our daughter-in-law made them for us awhile ago, and they were fabulous. I liked them so much, I made them again for my office holiday party. You can use these Mushroom Meatballs in pasta sauce or a cream sauce, or put them in a gravy and use them as appetizers. The original recipe came from All Recipes. 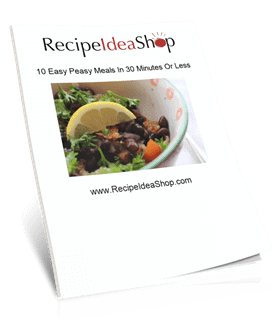 A nice casserole dish is perfect for this recipe. Corningware French White 10 Piece Bakeware Set. Buy it on Amazon. 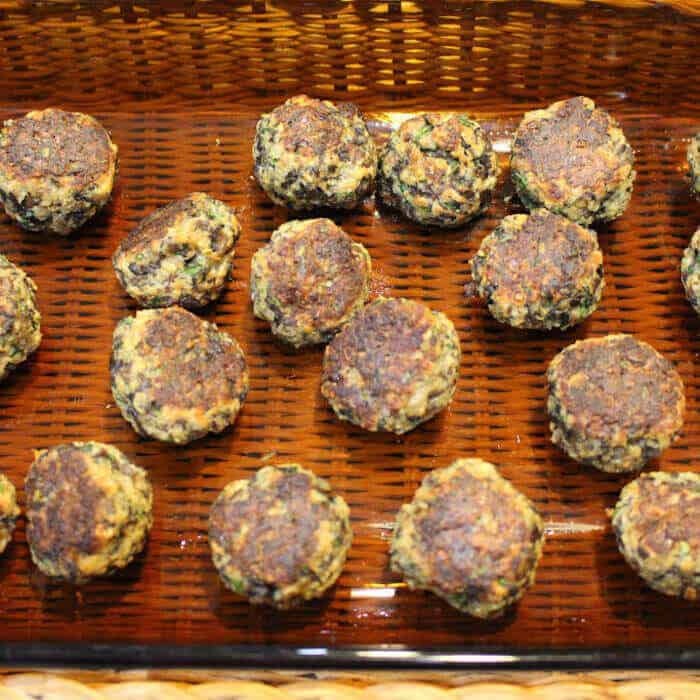 Tasty, "meaty" vegetarian meatballs made with mushrooms. In a skillet over medium-high heat, heat the olive oil until hot. Add the mushrooms to the pan, sprinkle with salt, and cook and stir until liquid from mushrooms has evaporated. Add the butter, reduce heat to medium, and continue cooking and stirring mushrooms until golden brown, about 5 minutes. Add the onion to the pan and cook until the onion is translucent, stirring frequently, about 5 minutes. Add the garlic and stir until fragrant (1 minute or so). Transfer the mushroom mixture to a large bowl. Add the parsley, bread crumbs and oatmeal to the mixture and stir to combine. Add one egg, salt, pepper, cayenne, oregano and nutmeg and mix thoroughly. Add the cheese and stir gently to combine. Stir in the remaining egg. The mixture should hold together when pressed. Cover the bowl and refrigerate over night. Line a baking sheet with aluminum foil (oil the foil) or parchment paper. Form the mixture into small balls (about one inch in diameter) and roll in your hand until the meatballs are smooth. Place them on the prepared baking sheet and bake for 12-15 minutes until lightly browned. Remove the meatballs from the baking sheet and put them into a baking dish. 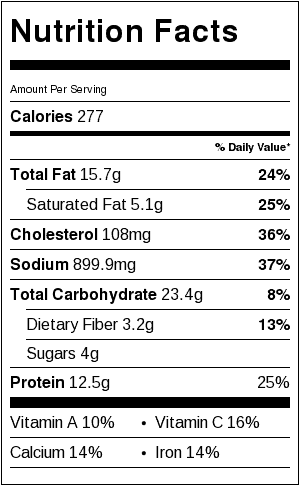 Vegetarian Mushroom Meatballs Nutrition Label. Each serving is 4 meatballs (does not include sauce).